Finding recipes online is easy; simply Google what you want, and you are sure to find a guide. However, I have struggled with remembering which recipes I’ve used, and using the bookmarks bar gets cluttered after so long. Instead of attempting to organize several folders and still managing to lose my favorite recipe for tomato quiche, I decided to search for a site that will help me save every dish I love. That website is Tastespotting. 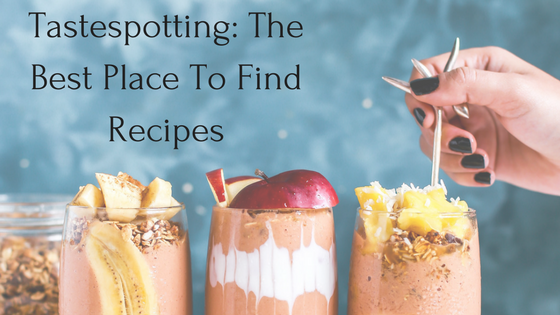 Tastespotting is a site that has been around for years, giving food bloggers a place to promote their recipes. Any food blogger can upload a link, as long as it contains a recipe, and most of them will be approved and go up on the first page. Here, you will find ethnic cuisine, down-home cooking, and delectable desserts. The best part is the front page changes daily, so you will always find something new to cook. As I said, my problem lies with saving the recipes I find, not finding them. Luckily, Tastespotting understands that and has implemented a solution. You can create an account and save any recipe you like to your favorites! All you have to do is click the star underneath the recipe description, and it will be saved to your favorites. The difficulty I ran into during my first few times using the site was where to find my favorites tab. To access it, you click on your username (in small, italicized font near the top right of the page) and then click on your favorites tab. Here, you will find your favorites listed in descending chronological order. This is perfect, especially if you want to save recipes for an event that is quickly approaching. Tastespotting has many pluses, but I would also like to suggest some ways it could improve. I would love a way to search through just the recipes I have saved without having to click through every page. As I use this site quite frequently, it can take some time to find what I’m looking for. I would also like the ability to create separate folders for different categories of recipes I save. I know I can do this on my own, but I would much rather do it on the website. Finally, I would love more social aspects. Perhaps friends could see what the others save. There could also be a rating system for recipes (or a place to share your experiences recreating them), and other similar features. I am sure the people who run Tastespotting have other jobs, but adding to the site in these ways could bring in more traffic. If you are looking for a recipe for your next dinner or social gathering, I highly suggest using Tastespotting. Not only will you find great recipes, but you will also be able to easily save the link to your new signature dish.